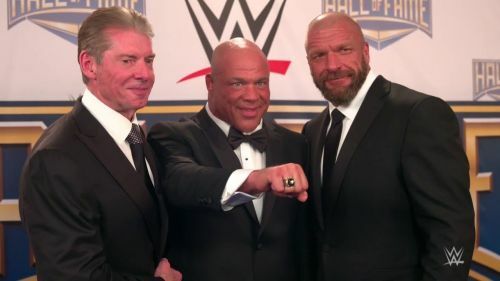 Kurt Angle will be retiring after WrestleMania 35 according to Oh, You Didn't Know Wrestling Show's, Brad Shepard. The Olympic Goal Medalist is likely to have his last match at the grandest stage of them all as per the report. Angle was inducted into the WWE Hall of Fame in 2017 and has been working with the company ever since. He was the RAW General Manager last year before he was abruptly sent on a vacation by Stephaine McMahon. He was then replaced by Baron Corbin, who served as an acting GM. The former WWE champions returned from his 'vacation' as El Conquistador and eliminated Corbin to win the Battle Royale on RAW. It earned him an opportunity to take part in the WWE World Cup but he was defeated by Dolph Ziggler in Round 1. The former GM was off screen again but made a surprise appearance to help Braun Strowman win his no disqualification match at TLC. He was a part of the Royal Rumble too but didn't make a big impact – lasting just 3 minutes and 15 seconds. Reports suggest that Angle is in a bad shape right now and can apparently move properly. He was compared to Mick Foley by Brad Shepard, the same source for Angle's last match at WrestleMania 35. It will be interesting to see who Kurt Angle faces for the last time. Baron Corbin might just be the likely opponent and that could prove to be a confusing thing. Do WWE give Kurt a win in his final match or should he put his opponent over and say goodbye? Have your say in the comments section below! WWE Rumors: Vince McMahon adding a unique twist to Championship match at Wrestlemania 35?